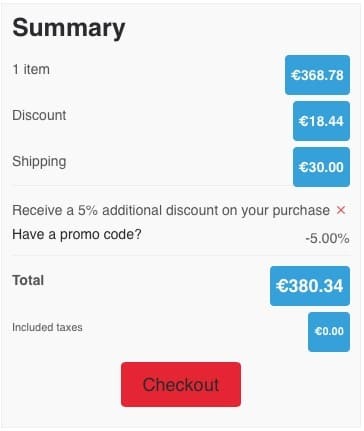 It's a 5% discount on your shopping cart, which is added even to the already discounted prices, with a minimum cart value of € 150. - HOW TO USE THE CODE? 1. THE COUPON CODE WORKS ON ALREADY DISCOUNTED ITEMS? 2. IS POSSIBLE TO USE THE COUPON CODE AGAIN? 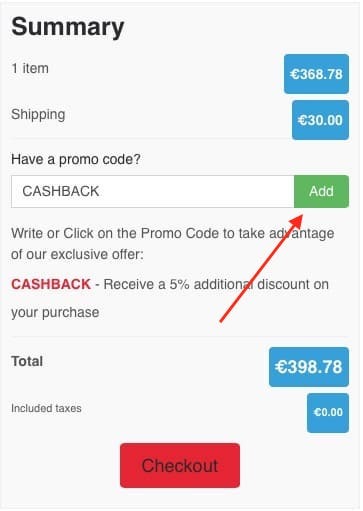 Yes, if you leave a Store review, you are entitled to use again the CASHBACK Code. 3. IS POSSIBLE TO USE THE COUPON CODE ON ANY VALUE CART? 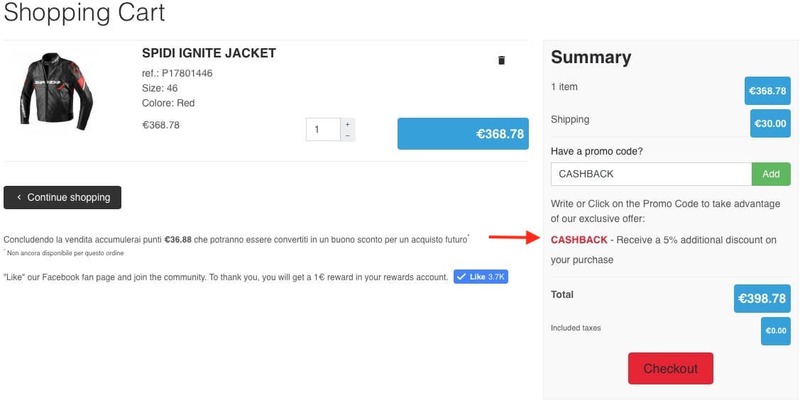 IT IS NOT POSSIBLE TO REQUEST A REFUND ON THE PURCHASE IF YOU HAVE NOT BEEN USED THE "CASHBACK" CODE BEFORE THE PAYMENT. - HOW TO EARN CREDITS? - HOW CAN I USE MY CREDITS? You can check the credits accumulated at any time from the dedicated panel on your account, with the possibility of turning them into a discount coupon to be used on the next purchase (on a minimum purchase of € 150 - € 123 VAT excluded). The Discount Coupons generated on your account will be combined with other Promotions and Active Savings.